As a final note from the Eighth Fota Liturgical Conference recently concluded in Cork, Ireland, the proceedings of last year’s conference, were launched by His Eminence Raymond Leo Cardinal Burke. 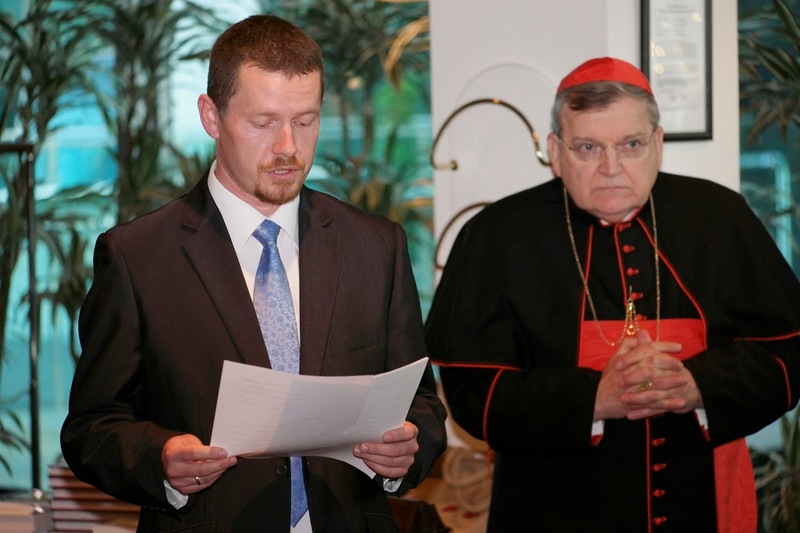 In his response to Cardinal Burke’s comments, the editor, Dr. Mariusz Bilineiwicz, provided a detailed outline of the volume’s contents and a summary of the various papers presented at last year’s gathering. The volume, entitled Agere in Persona Christi: Aspects of the Ministerial Priesthood, is published by Smenos Publications and may be obtained at discount through their webpage www.smenospublications.com. With great pleasure, I preside at the presentation of the Proceedings of the Seventh Fota International Liturgy Conference, held in July of 2014. The title of the Proceedings is Agere in persona Christi: Aspects of the Ministerial Priesthood. The Polish theologian Mariusz Bliniewicz, a faithful participant in the Fota International Liturgy Conference who has presented at the Conference in the past, edited the volume for Smenos Publications. With the imminent publication of the Proceedings of the Sixth Fota International Liturgy Conference, held in July of 2013, all of proceedings of what has become a recognized annual meeting of cultores of the Sacred Liturgy, the highest and most perfect expression of our life in Christ, will be available to the public. We are all in debt to the Saint Colman’s Society for Catholic Liturgy, especially its good secretary Terry Pender, for the organization of the Conference, to Monsignor James O’Brien who, with a certain genius, develops the program of the Conference each year, and to the Knights of Columbus and other benefactors who help make possible the Conference itself and the publication of the Proceedings. I now invite Mariusz Bliniewicz, the editor of Volume VII of the Proceedings, to give a brief formal presentation of the volume. I would like to start this very short presentation from expressing my gratitude to the organizers for inviting me to this year’s conference which, as always, turns out to be a very fruitful and enjoyable academic and liturgical enterprise. I always come to Cork with great pleasure and also with great pleasure I accepted the invitation to edit last year’s papers, which stand today before us in the form of this handsome volume. I think all of us will agree how fortunate it is to be able to have the proceedings of the conference available one year after the conference itself, not two years, as it has been initially. It is also very fortunate that the leitmotif of this collection (ordained, ministerial priesthood) corresponds very well with the topic of this year’s conference (royal, baptismal priesthood of the faithful). When I first heard about the topic of Fota VII I thought that it would be very desirable and useful to include a reflection about the relationship between the ordained, ministerial priesthood and the royal, baptismal priesthood shared by all the faithful. Obviously the organizers of the Fota Conferences had the same impression and decided, very fortunately, as I said, to follow up on this topic and devote the whole conference this year to the topic of the royal priesthood of all members of the Church. In my Foreword to the volume of Fota VII I refer to an opinion which was recalled by Fr James Moroney at the Fota Conference IV in 2011, that perhaps the most imperative theological issue at the turn of the twentieth and twenty first centuries will be the topic of ordained priesthood. I would add that one of the most relevant issues within this wide topic is the relationship between the ministerial priesthood and the royal priesthood. The Second Vatican Council left us with a succinct, laconic statement that these two dimension of Christ’s priesthood ‘differ not only in degree, but also in essence’ (LG 10) and decided not to elaborate on it further. Proceedings from the last year’s and this year’s conference will certainly constitute a great tool in pursuing further theological reflection upon this relationship, which is not a purely academic matter, but which touches deeply our everyday, Christian existence, especially our parish lives and the way the contemporary Catholic parishes function and operate. This is especially important in countries such as Ireland, where a restructuring of the parish life is taking place and takes different forms such as agglomerating parishes together, moving many of the parish tasks and responsibilities into the hands of lay people, or ordaining married men as permanent deacons. All this requires a renewed reflection on the identity and essential role of the ministerial and royal priesthood, first of all on academic level, but also on the practical level. Thus, the volume with which we are presented (Fota VII) now should be, in my opinion, read together with the next year’s volume (Fota VIII), which will gather this year’s contributions. 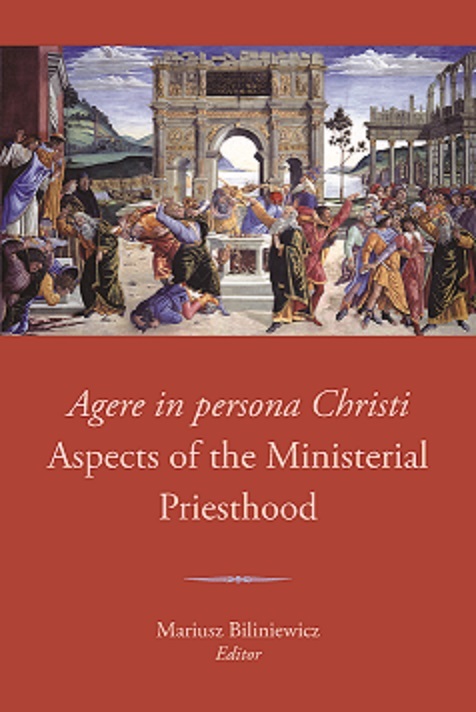 The papers gathered in the volume ‘In Persona Christi Agere – Aspects of the Ministerial Priesthood’ were organized in a systematic manner, according to a well known theological method. Since the Bible is the ‘soul of theology’ (DV 24), it begins with scriptural reflection of Fr. Dieter Bohler on the notion the service of the Levis in the Temple and its relation to the mission of the Messiah in the work of St. Luke, the Evangelist. Then, the theology of the Fathers of the Church comes into the conversation with Fr. Stefan Heid’s presentation of the notion of the altar as the centre of prayer and priesthood in the early Christianity. Next, a systematic reflection upon the various aspects of the ministry of the ordained priesthood is carried out. Fr. Joao Paolo de M. Dantas takes a close look at the concept of the priest acting not only ‘in persona Christi’, but also ‘in persona Christi Capitis’ (in the person of Christ, the Head), while Fr. Sven Conrad, FSSP, examines the relationship between the celebrating priest and the sacrificial action of the Mass, in which he presents the hitherto developments and points to areas where further reflection is needed. Card. Raymond Leo Burke’s paper on Card. Pietro Gasparri’s theological and canonical contribution to the topic of the role and the identity of the ordained priesthood introduces the reader to more contemporary authors and topics. Bishop Philip Boyce’s paper looks at the priesthood and its intercessory role through the eyes of Bl. John Henry Cardinal Newman, Fr. Thomas McGovern analyzes the topic of priesthood in the teaching of. St. Pope John Paul II and Christian Schaller examines the theology of priesthood in Joseph Ratzinger’s episcopal homilies. Fr. Manfred Hauke provides the reader with a systematic reflection upon the ministerial action of the priest acting in persona Christi Capitis in the context of sacramental diaconate and informs the reader about the recent theological discussions regarding this topic. The volume concludes with an outlook to the future – Andrea Bellandi’s examination of Joseph Ratzinger’s vision of the role of a priest in the third millennium gives the reader a grasp of the vision of our Pope Emeritus regarding the ministerial priesthood in the years to come. Thus, as can be seen, the volume offers the prospective reader a number of different angles from which they can look at the question of ordained priesthood: biblical, patristic, systematic, canonical, historical, practical and pastoral. Naturally, the volume does not aspire to be an exhaustive treatment of the topic of priesthood, but rather to be a useful contribution to other existing sources, both magisterial and academic. It is the hope of the editor that the proceedings of the Seventh Fota International Liturgical Conference, which now perhaps could and should change its name to Fota International Liturgical and Theological Conference, will turn out to be a useful tool for further investigations on the matter of the ministry of ordained priesthood, which our present Pontiff, Pope Francis, called once ‘a sign of the presence and action of the Risen Lord’ and a ‘building element of the community of brotherly love’.